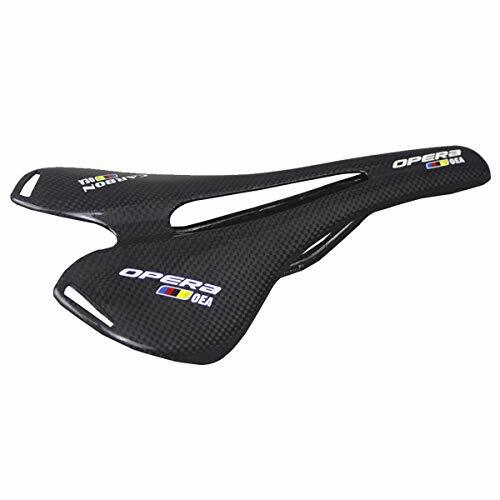 OPERA Bike Seat – Ergonomic bicycle saddle with maximum comfort and good ventilation. Carbon bike saddle most comfortable bicycle seat for road bicycle, Touring and Indoor and outdoor cycling for men. All carbon fiber seat，best material for bike seat ,Structure of arched carbon fiber, light, firm and shock absorption,Ergonomic design,Ideal for remote mounting. ❣ Excellent Design – Nose shape design and middle part of vent design will provide you with a cool feeling, Excellent shockproof and maximum firmness. ❣ Easy installation- A great replacement for your beloved bike and easy to be installed on any standard seat post.Advise Please use the suitable seat clamp which similar to the seat bow, to provide maximum firmness and comfortable. ❣ Suggest – This bike seat is Made of Full Carbon Fiber Sheet without padding,Please wear the professional cycling pants with pad if you ride for a longtime. ❣ Pro Quality – We’re so confident about the quality of our products that if you have any product issues, we’re very happy to either provide a Refund or a Replacement – can’t say fairer than that !